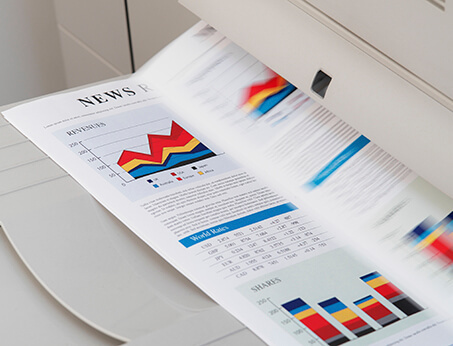 Our helpful, friendly, and creative staff provides the same caring service for black and white prints as we do for color copies. You have the option of stapling in 12 different positions, including saddle stich and single sheet trifold pamphlets to name a few. Our professional and friendly team will also assist you with date stamping, page numbering and watermarks. ABC Reprographics will produce your black and white prints in a way that helps you establish your brand and identity. People will know that you have claimed ownership of them when you leave your name, time and date you created your work. This is your way to leave your mark in the world, regardless of where you do business. However, we specialize in black and white printing services in Denver. You can call on us if you need help creating an executive report, a self-published novel, or a multimedia portfolio. Additionally, we know how to utilize the power of black and white for making a strong statement with any project. These classic shades are emblematic of boldness and power, which is why it is a color used by many haute couture fashion houses. These colors also signify history, culture and elegance in various parts of the world. In addition, you can use black and white to portray a certain kind of innocence that comes with remembering your childhood or appealing to the right consumers. One use for black and white photos other than in business logos is for wedding portraits. If you run a small digital photography operation, for instance, we can help you process your digital prints. This helps you offer your picture-taking and multimedia services at a reasonable cost, because you do not need your own darkroom. If you have any questions or concerns about ABC Reprographics, please contact us today. We want to help you make all your personal and business photos look as sharp as possible. Our creative team can also assist in helping you create biographical portfolios for any use.